The name is a reference to the popular Tower Defense maps in Starcraft and Warcraft. Hmm… tower defense… No, that's a silly idea– it would never work! This is Blizzard we're talking about, they throw in references wherever they can. Plus War- and StarCraft are known for all the Tower Defense, so I wouldn't say this is a coincidence. I thought this was the hardest achievement of the lot in the Battlemaster set of achievements, or at least the most time consuming (beyond possibly WSG exalted). Then I respecced my shaman 51 points in elemental, and it suddenly became not so hard! This was a fun one. One game I kept going back and forth between frostwolf towers recapping till a group of 5 guys decided to mow me down. This should honestly be called "The Cutthroat Jerk" or something, since it's basically just a internal struggle of who can press the flag quickest. And you'll get extra point for ignoring the opponents the other guys are currently fighting and just spamclick the flag instead, or if you're a paladin, BoP the other guy just as he is about to cap. Seriously though, this achievement is really going to get on your nerves before you complete it. And you are going to ask yourself just why won't everyone in a 10 yards radius around the flag get credit. WHY? Children's Week makes this achievement extremely easy to get. Can easily get 10 in one game, 90% of opposite team will let you so they can try to recap it. Ok, so if I have understand this correct, to get this achievement done you need to, Assault a tower ( you are the one who needs to take flag or else it dosen't count ) and stay there until the tower is destroyed ? I am not getting credit for towers in AV. I opened a gm ticket and was told I had to capture the flag, not simply defend the tower, but having done that, I still have 0/50 in my achievement. I'm certain I was the only one to click the flag. Of course on my 2nd gm ticket they got to me while I was logged off and I have received no response. Any ideas as to what is going wrong? Anyone else having the same issue? Thanks. Edit: I found out that a tower must be flipped after the Horde have taken it but before it burns. I haven't pulled this off yet, but as 2 gm's didn't know this I thought I would post. thats just rubbish the above expalnations tbh....when enterign the BG i went straight to Tower point,took the flag and waited...a bit later more AL got there and then horde ame,we defended the Tower.....nothin.....wtf? This will be a pain to get, but during the Winter Veil event, use snowballs that you find on the field to your advantage. If your opponent is hanging on the edge of a bunker, use the hardpacked snowballs to knock them off the edge to give yourself enough time to recap. As a Tauren Druid, I find it easiest to get this achievement when the horde is pushing hard on the Alliance Territory. Simply hang back in the Frostwolf area and track humanoids. Normally, you'll find one character that decided to sneak south to ninja some Towers. When you see his dot appear in a tower, start prowling your way to the top. Once they cap, they'll jump down and go to the other tower. As long as you recap while they're capping the other tower, you have a good way to make some easy defends. 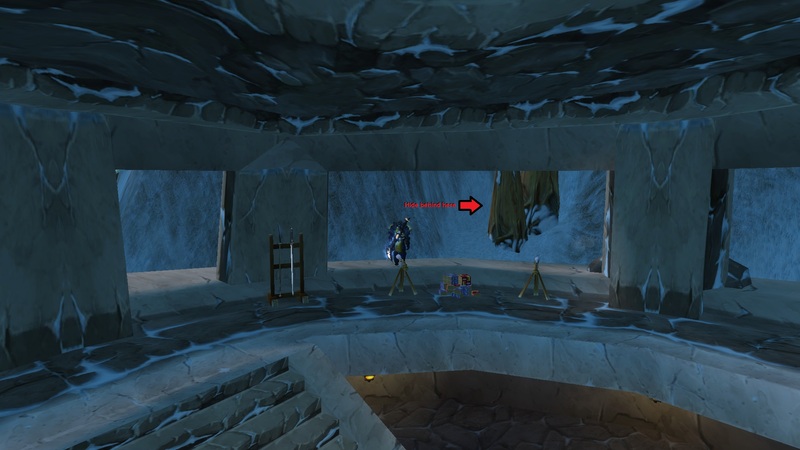 Keep this player alive and let the raid know you're doing the achievement so no one comes back to kill him. Go there for a more detailed guide on how to do this achievement. I wouldn't go much further than trying to defend your own towers at your base. Otherwise you won't accomplish much if you go mid-field since you will be all on your own down there. The following trick worked pretty well for me as an Alliance Night Elf Warrior, and I think it will work well for any Night Elf or (Alliance) class that can stealth. 1. When the battle begins, make your way directly to Dun Baldar North. I prefer this one to south for reasons I'll explain later. 2. There's a rock on the outer ledge of the tower behind a pillar farthest from the bridge (farthest north). Stealth there. 3. Sit back and wait, and let the recapping begin. 1. Night Elf Shadowmeld isn't as good as a rogue stealth (and probably not as good as a Druid's stealth either). Consequently, it was important to be as far away from the action as possible. That rock seemed to be far enough away from the flag and action to escape notice, but close enough to reach the flag quickly. 2. I've found that the Horde tends to hang out at Dun Baldar South, while they usually tend to cap and leave at North. They also tend to run along the side with the archers (and away from your stealthed side) at North, and then hop off and leave to either fight Alliance or join other Hordies at the main keep. 3. It helps being a prot. specced warrior in PVP gear in case I'm discovered! 4. Like MacDisciple says, the Horde will sometimes guard, but (in my case) I could sneak up while their backs are turned, recap, run behind the closest pillar, re-Shadowmeld, and then usually repeat at least once more. Horde will usually turn their attention to the bridge and/or stand on the tower entrance once they cap, especially if there is a fight in the area. 5. Best of all, it doesn't become the "Cutthroat Jerk" achievement Load mentions. Most Alliance don't hang back at the Towers in the beginning, and if they're around they're fighting on the bridge or elsewhere. Outside of the occasional rogue I rarely ever had any other Alliance come into the tower, so outside of the twinges of guilt for not joining in on the bridge battles and helping out I never had to feel that I was being cutthroat as I would trying to recap a mid-tower. I usually netted 2-3 recaps per battle. Your mileage will vary. My recap sometimes brought up more Horde/Horde rogues thinking there was a rogue in the tower, so be on your guard after the first recap. Enjoy! This is how i got my achiev as a lock on ally side, i went to South Bunker, placed the summon portal behing the flag, went out of bunker waiting for horde to cap, since ally usually don't defend these bunkers horde leave as soon as they cap, i teleported and recap, easy cake. Got 2-3 caps in every AV. Obviously a boomkin or shaman (horde side) is preferable due to knockbacks but it's still a time consuming achievement. Have fun and take care. Personal best 7 defends in one game. One of those achieves that seems daunting until you focus solely on it. It took me 5-6 hours to get the 26 backcaps I needed to complete this for my AV Master, with most AVs producing 1-2 backcaps. This achieve is probably a lot more difficult/grindy for Horde to complete and might be virtually impossible without knockbacks. As an Alliance Disc Priest, I got most of my backcaps at DB North/South because Horde often vacate these bunkers once they turn the flag. I had especially good luck at DB North. I found several Priest tools to be helpful for this including Dominate Mind, Spectral Guise, Psychic Scream, and the Stormpike recall trinket. There were a couple occasions where I waltzed into a seemingly empty bunker only to be Sapped by a Rogue; I let him Sap me three times and then popped my trinket on the Kidney Shot, followed by an immediate Psychic Scream and an immediate flag cap. This sometimes works to steal the cap if he doesn't have his trinket up. Other times, I used my recall trinket to port back to DB, I immediately popped Rocket Boots+Spectral Guise to sprint over to DB North, and with any luck I would reach DB North without anybody noticing and without anybody being inside it. There were a couple occasions where I waltzed into a seemingly empty bunker only to be Sapped by a Rogue; I let him Sap me three times and then popped my trinket on the Kidney Shot, followed by an immediate Psychic Scream and an immediate flag cap. The 8-second fear is sometimes enough to steal the cap if he doesn't have his trinket up. I'm coming to the end of my journey with this achievement and I've used the following strategy for getting anywhere from 1-5 caps per game. You will need a 6级雷矛勋章, 德拉诺隐形药水, and optionally the toy 远水海螺. It should also be noted that this is a method for members of the Alliance. Follow the main group of people down to Galv and help kill him so that you aren't just AFKing. Once he has been slain, equip your 6级雷矛勋章 and use it to teleport back to Dun Baldar. Hopefully you have made it back before any Horde are coming across the bridge, if they are then use a 德拉诺隐形药水 and run to the northern side of the North Bunker (Image) and simply wait amongst the trees for someone to come and cap. I would suggest enabling nameplates or using the 远水海螺 so that you can see how many players are inside the bunker. Being a warrior I was able to (after playing with the angle) Heroic Leap from the trees to inside the bunker, however you can also make the jump up if you use Nitro Boosts or a Goblin Glider. Your class may have additional tools to make things a little easier such as knock backs or stuns so keep that in mind while you grind out this achievement. Pretty straightforward. Just defend at your base, there will always be 1-2 stealth players that will try to cause a nuisance and you can almost always recap the tower after they get it. Bonus points if you can stealth as they wont know you are there (after they cap one they will move to next tower so you can recap the first one easily).